Breakfast Included: Pancake, Chocolate Flavor Syrup, Maple Syrup, Coffee, Milk, Ice Tea, Fresh Fruit. 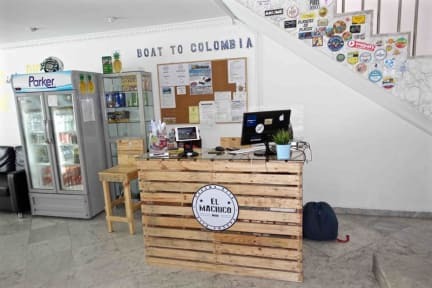 El Machico Hostel is a young and dynamic Hostel, situated in a big house in Marbella zone, among the more exclusive zones of Panama City, located near the pharmacy, restaurants, supermarkets, ATMs, shopping centers and Hard Rock Cafè. El Machico Hostel boasts an ample swimming pool with open air cinema by night, pool table, and a small bar. Besides the dormitory, we also have available a marvelous private room with a private bathroom, all rooms with Air Conditioning. All beds are equipped with power outlets. El Machico Hostel offers free breakfast to all customers (Pancake, Chocolate Flavor Syrup, Maple Syrup, Coffee, Milk, Ice Tea, Fresh Fruit). Our well informed staff is always at your complete disposition for any information about the city and various excursions. We can also book tours to Islands of San Blas (2 Days/1 Night from $ 110) and much more. We are leaders in Panama City for tours to San Blas Islands. *The Cleanliness Of The Guest Rooms And Other Areas Of The Hostel Is Extremely Important To Us. We Guarantee To Provide A Very Clean And Sanitary Environment To All Of Our Valued Guests. In case of a late cancellation or No Show, you will be charged the first night of your stay. Check-in: from 1pm to 12am. If you arrive earlier you'll be more than welcome to chill in the common spaces, use all of our facilities or just store your luggage with us and go exploring town while you wait for your room to be ready. Check-out: 11am, but we will keep your bags for free all day long if you need. Mostly good but this hostel didn’t give me a good sleep because noisy music until night.